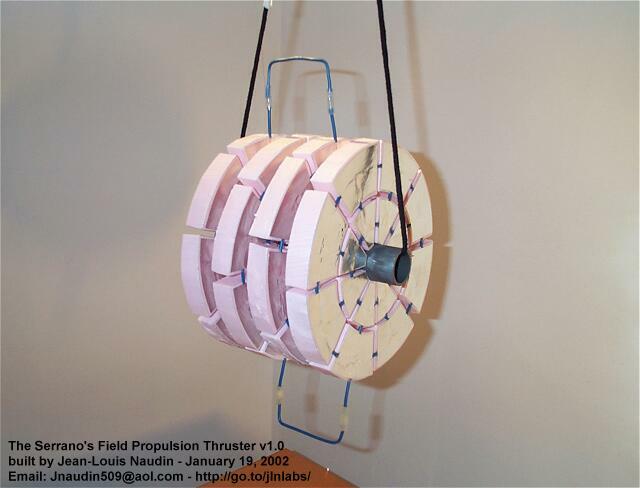 On October 5, 2000, the Hector Serrano's patent WO 00/58623 " Propulsion device and method employing electric fields for producing thrust " has been granted. 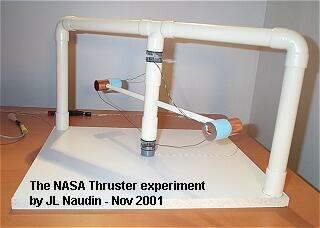 This patent is very close to the Aymmetrical Capacitor Thruster ( ACT ) patented by the NASA ( patent US 6,317,310 , granted on Nov 2001 ) that I have already tested successfully in Nov 18, 2001 ( see the NASA ACT v1.0 experiment ) . These two devices use the Biefeld-Brown Effect for producing a thrust Vs the surrounding medium ( this effect was discovered by Townsend Brown in 1928 in his Gravitator, see the GB Patent N°300311 filed on Nov 15, 1928 "A method of and an apparatus or machine for producing force or motion" from T.Townsend Brown ). 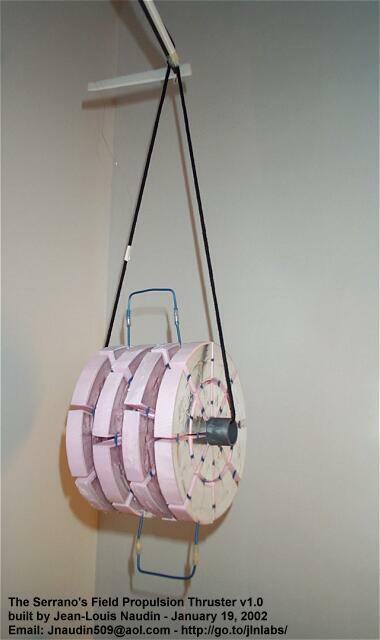 On January 19, 2002, I have fully replicated and tested successfully this Electric Field Propulsion Thruster patented by Hector Serrano from Gravitec Inc. ( see the photo below ). 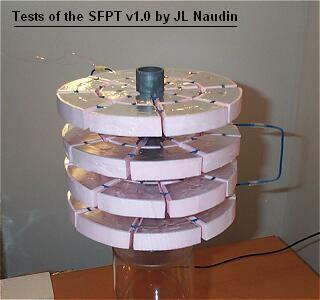 The SFPT v1.0 is hanged on a free rotating apparatus. The High Voltage is sent through thin wires coming from the top and the bottom. 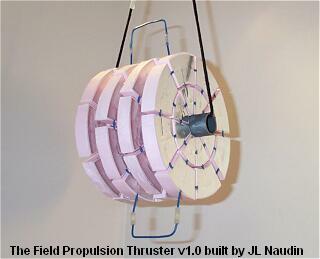 When the HV power supply is switched on, the Field Propulsion Thruster v1.0 is rapidly set in motion. The voltage used is 27 KV DC @ 480 uA. The turn speed observed is low. This is due to the low dielectric constant difference producing a weak non-linearity between the two dielectrics used in this experiment ( K=2.53 for the Polyfoam XPS and and K = 1 for the Air ). 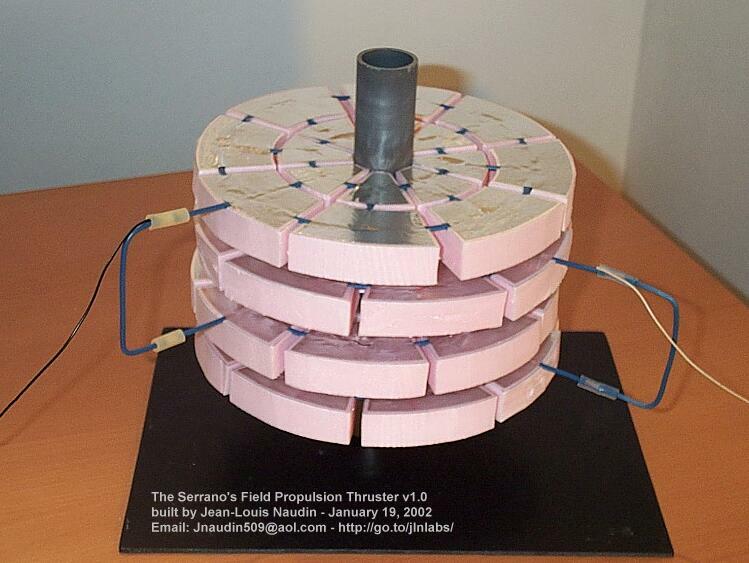 The motion of the SFPT v1.0 and the net resulting thrust observed in the direction of the conductive armature when the High Voltage is applied confirms the field propulsion effect claimed by Hector Serrano in his patent. Patent WO 00/58623 ( Oct 5, 2000 ) " Propulsion device and method employing electric fields for producing thrust " from H. Serrano. NASA patent US 6,317,310 ( Nov 13, 2001 ) "Apparatus and Method for generating a thrust using a two dimensional asymmetrical capacitor module"
Link to the Gravitec, inc web site.